Om Networks now offers bundled land line voice and broadband Internet for the low price of $42.95 per month plus tax. Say goodbye to mega-corporate frustrations, and enjoy local, and professional customer service. End your relationship with the broadband Internet duopoly, using your data as a marketing product, and an easy subpeona away from divulging all your data. Communication, secure, private and within user control, and network operations transparency. Now available in Davis, Woodland and Sacramento, and throughout Southern California. The closer you are to the Central TELCO office the better the speed, up to 20 Mbps down and up 1Mbps up. 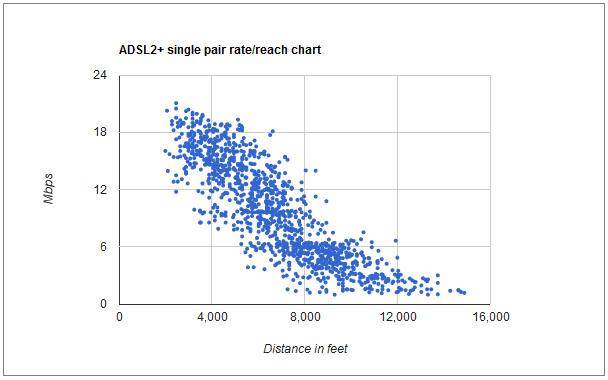 Some data correlating distance to speed is available in this graph. The best part to all this is you no longer have to hassle with the Regional Bell Operating Company, and can get all your support from small business. You can port your existing land line phone number to OmFusion. The order window from order to completion is 1-2 weeks. On a land line port from existing service, there is about 1-2 hours of downtime on the due date but that is all. Serious orders only please, a lot of work goes into ordering, installing and providing this excellent product to your residence or business. Business locations are an additional $5 per month, and Static IPs are available at $6 per address per month, and available in increments of 1, 4 and 8. ADSL2+ Gateways (Modem + WiFi) are available for a $75 deposit. VDSL2 Gateways (Modem + WiFi) are available for a $100 deposit. ADSL and VDSL Bonded Gateways (Modem + WiFi) are available for a $160 deposit. Deposits will be refunded up return of the working modem or with power supply if services are canceled. Order inquiries by phone or by emailing sales@omsoft.com, include your full address, name, and telephone number if available. An online order form will be available soon.